ASTON SOLID OAK RANGE. HUDSON CHUNKY PINE RANGE. NEW OXFORD CHILDRENS FURNITURE. RATTAN GARDEN FURNITURE RANGE. REIMS FRENCH PAINTED RANGE. ELLIS PAINTED OAK RANGE. DEVON SOLID OAK RANGE. WINDSOR RUSTIC OAK RANGE. CHILTERN PAINTED PINE RANGE. PACIFIC DARK OAK RANGE. LINCOLN CHUNKY OAK FURNITURE. LEWIS CURVED WALNUT RANGE. LEWIS CURVED OAK RANGE. Banbury Glass Dining Sets. HENLEY HIGH GLOSS DINING RANGE. PORTO RECLAIMED IRON & WOOD. LOOE RECLAIMED WOOD RANGE. NEW SHERWOOD OAK RANGE. LANGHAM LIME WASHED OAK. BOURTON PAINTED OAK RANGE. Double Bed 4ft 6. Super Kingsize Bed 6ft. Consoles And Lamp Tables. Dining Table & Chairs Sets. Dressers & Buffet – Hutch. Rattan Dining Table Sets. Console And Lamp Table. DVD & CD Racks. TV Cabinets & Stands. 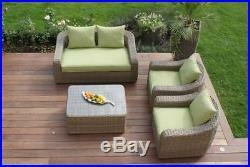 Natural Milano Rattan Outdoor Garden Furniture Rounded Green Sofa Set & Cushions. Natural Milano Rattan – Rounded Sofa Set Green Cushion. Is a must have for everyone who likes to dine outside in comfort & style. Featuring the best of rattan sofa sets and the best of rattan dining sets. Utilizing the stunning mixed flat weave this set can be left out all year round and with a solid aluminium frame you will never need to look anywhere else for the highest quality, rattan furniture, on the market. Height:(710mm) X Width (1450mm) X Depth (820mm). Height (710mm) X Width (800mm) X Depth (820mm). Height (420mm) X Width (900mm) X Depth (710mm). Includes Rounded Sofa, 2x Armchairs, Table & Cushions. Available in Beige or Green Cushions. The Flat Weave rattan is hand finished / woven over a rust resistant frame hence making it ideal to leave outdoors. The rattan is Ultraviolet (UV) light resistant to ensure that the colour does not fade in the sun. It is very easy to clean using a normal hosepipe or a power washer. Milano Rattan furniture is available in brown (also some items where applicable in Grey) with cushions. The cushions are removable and hand washable. 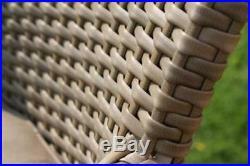 Milano Rattan Garden Furniture include various chairs, cube set. OTHER ITEMS IN THE RANGE. Fusion Solid Oak Wood Furniture 4 Seater Small Rectangle Dining Table & 4 Chairs. Atlantis Wooden Furniture Wide Chest of 6 Drawer Natural Oak. Milan Rattan Outdoor Garden Accessories Set of 3 Shaped Brown Planters. Fusion Solid Oak Wooden Furniture 4 Seater Small Rectangle Dining Table. Colchester Rustic Oak Furniture Wooden Corner Cupboard 2 Door/Shelf Cabinet Unit. Belfast Reclaimed Living Room Furniture Blue Rectangle Coffee Table. Rattan Outdoor Garden Furniture Roseisle Brown Day Bed with Table & Cushions. Atlantis Wooden Bedroom Furniture Dressing Table Natural Oak. Atlantis Wooden Bedroom Furniture Single Bed Bedstead Natural Oak. 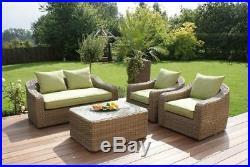 Dorchester Rattan Garden Furniture Rounded High Back Sofa and Coffee Table Set. California Rattan Outdoor Garden Furniture Rectangular 6 Seat Natural Dining Set. Oban Oak Wooden Dining Room Furniture Upholstered Full Back Dining Chairs PAIR. 4 CHEQUES / POSTAL ORDERS: Please make all cheques/PO payable to SWJ UK Ltd. On small items e. Unfortunately not all items are available for next day. If there is a delay we will notify you ASAP. Deliveries are booked in 2-3 days prior so you will know when your goods will arrive. Surcharge Areas, Scotland & Wales Postcodes Depending on the order size we can waive this off for you. For the following postcodes-IV, DD, PA, AB, KW, EH, DG, FK, G, KA 1-26, 29, 30, KY, ML, PA 1-19, PH, TD, LL, LD, SY16-20, 23-25, SA. CF, NP, Northern and Southern Ireland, Isle of Man, Isle of. Channel Islands and Scottish Isles an additional charge may apply. Carrying each item into the room of choice up the stairs etc. Please notify us if you prefer this service, we can quote you the price. Includes assembly the items. Full Installation , position the item into the room of choice. Please notify us if you prefer this service and we can quote you the price. This is important and ensures you are happy with our terms. We want your shopping experience to be a happy one and wish to avoid any complications later on. This may sound obvious, but unfortunately this does happen occasionally. We will try our level best to resolve the problem to your satisfaction. Faulty Items : We do our best to ensure our products reach you in perfect condition. 3 The Item is complete. 4 We are notified within 14 days. 4 We are notified within 30 days. Reims white painted furniture. ROCHA dark mahogany furniture. Milan rattan outdoor garden furniture. Clifton solid oak bedroom furniture. The item “Natural Milano Rattan Outdoor Garden Furniture Rounded Green Sofa Set & Cushions” is in sale since Wednesday, February 4, 2015. This item is in the category “Garden & Patio\Garden & Patio Furniture\Garden & Patio Furniture Sets”. The seller is “fusion-furniture-store” and is located in GB. This item can be shipped to United Kingdom.